It's been 15 years since we've had an installment of the Alien series if you discount the Alien vs. Predator films. It's been 33 years since the monster of all monsters burst, yes literally "burst" onto the scene. Sitting at the helm of this latest cinematic opus is none other than Ridley Scott, the director of that first Alien film and the director of numerous high-profiled films such as Blade Runner, Black Rain, Thelma & Louise, Black Hawk Down, etc. Expectations have been running high and now that I've seen the movie in IMAX 3D no less, here is my take on Prometheus along with a recap of the Alien franchise. I can echo what many other reviewers have already stated. Ridley Scott aims high and offers up a good film but falls short of giving us a great film. Receiving a very respectable rating of 73% on Rotten Tomatoes, the number says it all. Prometheus is good. If you have any interest in Alien and the various sequels, you have to go see this film. However, there is a big difference between a respectable rating of 73% and an excellent rating of 80% or 90%. 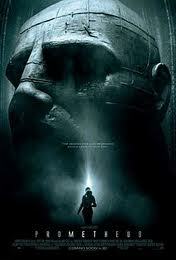 The story of Prometheus is for all intents and purposes a prequel to the original 1979 film Alien. However, instead of being another science fiction horror film, it attempts to get profound by venturing into the philosophical arena of where we, the human race, came from and why. From day one, speculation has run rampant about who the "space jockey" was and now we have some background to this mysterious traveller. While that idea unto itself is worthy of its own movie, the screenwriters Jon Spaihts and Damon Lindelof have mixed this with our favourite monster who turns out to be some sort of biological weapon. We never find out why, but the crew of the Prometheus discover the Engineers are going back to Earth to unleash this biological weapon supposedly with the objective of wiping out the human race. Had the Engineers fallen out of love with their creation? Did the Engineers feel that we were out of control and had to be stopped before we started wreaking havoc on the rest of the solar system? Upon reflection, the idea of the Alien being a biological weapon strikes me as being odd. Most apocalyptic scenarios have some sort of microorganism getting out in the open. Put it in the air, introduce it into the water supply and those little critters multiply like hot cakes and infect us all. The result is your standard zombie apocalypse. Using an alien as we have seen in the Alien franchise seems like quite an inefficient way of eradicating the human race. Yes it will work. Yes, for the purposes of a horror story it is a horrible way to die but efficient? If the Engineers are so far advanced they are running around the universe seeding planets to produce life, why can't they come up with a better biological weapon? I have a very personal confession. Ever since I was a little boy, horror movies or maybe just suspense in general have always scared me. I mean like really scared me. I remember when I was 13 years old watching the 1963 TV series The Outer Limits, I actually ran out of the room then peeked around the corner at the television. My parents had to laugh and now I have think it was kind of amusing. Flash forward to 1979 when the movie "Alien" came out. I was 27 years old. Halfway through the film, I asked why I was torturing myself. I was so scared, I wasn't actually enjoying things so I got up and walked out. A week later, I had a couple of drinks to steel myself then went back and sat through the entire movie. I think I managed to get through it by quietly saying to myself, "Okay, the monster is going to jump out... now! ... Okay, now!" All right, I'm an idiot. I'm totally ridiculous but for some reason horror is just not my cup of tea. You won't catch me watching any of the Saw films or Jason or Nightmare on Elm Street. Ugh. No fun at all. On more than one occasion I've made whoever was sitting beside me laugh as I would nearly jump through the roof when the monster did finally jump out. But I am an absolute nut about science fiction so I just had to go back to see the entire film. Yes, Alien is a horror film but it is also a science fiction film. And for anybody lining up to see this latest installment, remember that the budget of the very first film Alien was a mere, no a scant $11 million. Eleven million bucks? I recently saw The Avengers and Men in Black 3. Both films had budgets of $220 million. This film Prometheus clocks in with a budget of $125 million. Is bigger better? The very first Star Wars film released in 1977 also had a budget of just $11 million. That number is all the more stunning when you realise that any modern day blockbuster seems to require at least two hundred million dollars. Apparently those special effects aren't just special, they're expensive. Something growing inside me? Eew! When the original film came out, I, like a lot of people I'm sure, was quite horrified by the idea of something growing inside my body. However had I forgotten my childhood or the last trip to a tropical paradise? Did I hear anybody say pinworm? How about hookworm or tapeworm or even lice and ticks? Now you can say, "Eew!" because yes, folks, we can have critters living inside us or in our skin. Yes, there is a host of human parasites which can be in our bodies but when I say pinworm or tick I'm talking about something which you can see with the naked eye. Now that's big. Eew indeed. However the idea presented in Alien, a critter gestating inside another living being, is not unknown to our world. Certain flies (see Wikipedia: Tachinidae) deposit their eggs inside a host. When the larvae hatch, they go to work eating the body of the host from the inside out. Eew? Imagine that being done to you. Ha ha. Now there's a horror story for you. What is the connection between this Titan and the film? Play with fire, get your fingers burned? I'll leave that one for you to figure out. While the original film was good, the sequels have had their ups and downs. James Cameron's Aliens was excellent and it is not often that number two is good. (Although, Cameron's Terminator 2 was arguably better that his first Terminator.) From there, my impression was that the series lost its way. Were these projects green lighted out of an effort to cash in on the name? I'll make a short mention of the two Alien vs. Predator films which were obviously done to make a buck. They were panned by the critics but made substantial profits meaning the fans ate it up. As a FYI, the Wikipedia article quotes none other than James Cameron himself as saying he liked Alien Vs. Predator. Go figure. This is a good film; not a great film but a good one. If you are a fan of the Alien franchise, nothing I or anybody can say will keep you away. If you have never seen any of these films, this will be a good standalone picture and it may very well whet your appetite for going back and seeing each and every "burst". There is no doubt that Alien as a series will live on. The idea is a good one; the idea is a good horror story and whether our favourite monster stands alone or squares off against a Predator, I'm sure the public will be slapping down their money for the next installment of this extraterrestrial badass. Yes, the expansion of the history of the Engineers lends a little weight to the story but at the end of day, we all come for that heart-stopping moment when the bogeyman jumps from behind the curtain or, in this case, bursts from some poor soul's chest. I discovered two short clips not in the film. (see below at end) These independent clips are additional material to the movie and will, no doubt, end up on the DVD. Quite interesting and I'm sure more will show up as time goes on. Panspermia (Greek:allseed) is the hypothesis that life exists throughout the Universe, distributed by meteoroids, asteroids and planetoids. Directed panspermia concerns the deliberate transport of microorganisms in space. Directed panspermia may have been sent to Earth to start life here, or may be sent from Earth to seed new solar systems with life. Alien vs. Predator (also known as AVP) is a 2004 science fiction film directed by Paul W. S. Anderson for 20th Century Fox and starring Sanaa Lathan and Lance Henriksen. The film adapts the Alien vs. Predator crossover imprint bringing together the eponymous creatures of the Alien and Predator series, a concept which originated in a 1989 comic book. Anderson, Dan O'Bannon, and Ronald Shusett wrote the story, and Anderson and Shane Salerno adapted the story into a screenplay. The increased gore and violence over the first Alien vs. Predator can't excuse Requiem's disorientating editing, excessively murky lighting, and lack of new ideas. Aliens vs. Predator: Requiem (also known as AVP:R) is a 2007 American science fiction film directed by the Brothers Strause (Colin and Greg) and written by Shane Salerno. A sequel to 2004's Alien vs. Predator, it continues the film crossover of the Alien and Predator media franchises. The musical score for Alien was composed by Jerry Goldsmith, conducted by Lionel Newman, and performed by the National Philharmonic Orchestra. Ridley Scott had originally wanted the film to be scored by Isao Tomita, but 20th Century Fox wanted a more familiar composer and Goldsmith was recommended by then-President of Fox Alan Ladd, Jr. I laughed out loud when I read your comments about watching the first Alien movie in 1979. I was 23 and went with a buddy of mine. We were both so petrified by the plot that we left the theatre about an hour in. It's reassuring to know that we weren't the only ones! Actually, I've never seen the entire movie all the way through but, in light of Prometheus, I started watching it this morning and am just heading to the "big screen" to see the rest.